One person’s ideal body weight may be completely different from another’s. If you compare yourself to family and friends you risk either aiming too high if you are surrounded by obese or overweight people, or too low if everyone around you works as fashion models. Our ideal weight chart includes many of the most common formulas and methods for calculating ideal weight. If you are interested in losing weight, you can use the weight zones shown in our charts (based on your BMI or Body Mass Index) as a guide for choosing your target weight. But, keep in mind that there are many different methods for estimating your ideal weight, and many factors besides height and gender that ought to be taken into account, such as frame size, age, and muscle tone. You may also want to check out our new Weight Loss Charts or BMI chart. Many of the ideal weight charts you will find on the internet don’t list wh at formulas they are using to create the weight chart. 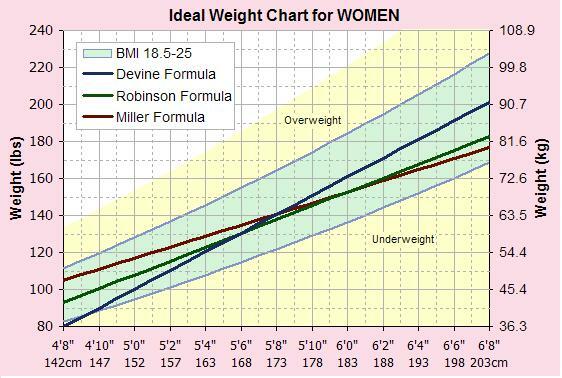 The three most popular formulas for calculating ideal weight are the Devine, Miller and Robinson formulas. The above weight charts and the spreadsheet includes all of these formulas so you can see the differences. They are primarily used for calculating medication dosages, and they don’t account for age, frame size, muscle tone, etc. See the references below for more information about these formulas. 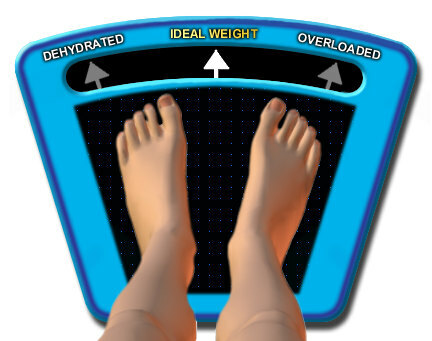 Another method for finding a range for your ideal weight is to use the “Normal Weight” range determined by the standard Body Mass Index range of 18.5 – 25 . The body mass index is only based on height and is calculated the same both both men and women. You can use our online BMI Calculator, but the one included in the spreadsheet also includes the Devine, Robinson, and Miller formulas. It is important to note that BMI for children is not calculated the same was as for adults. In the Ideal Weight Calculator included in the above spreadsheet, you will find two separate tables defining what BMI value is used to define Overweight. The standard value defined by the CDC is 25 for both Men and Women. I prefer to use the NHANES II definition which defines Marginally Overweight as over 26.4 for Men and over 25.8 for Women. Listed below are the formulas we used to calculate weight in pounds W[lb] given height in inches H[in]. Multiple the weight in pounds by 0.45359237 to get weight in kilograms.